BOISE -- Federal authorities are looking at returning Snake River fall chinook salmon above the Hells Canyon Complex of dams as part of a plan to eventually lift Endangered Species Act protections. That's one option in the National Oceanic and Atmospheric Administration's 326-page recovery plan for the ocean-going fish that was released Monday. "It's one of those things that's more easily said than done," said Michael Tehan, assistant regional administrator for the Interior Columbia Basin, noting dams and habitat degradation as two of the challenges. "But we would still ultimately like to get a second population up there." Snake River and tributaries above Hells Canyon, according to a executive summary of the plan. This area upstream of Hells Canyon supported the majority of historical Snake River fall Chinook salmon production until the area became inaccessible due to dam construction, the summary said. The fish could also access nine major tributaries that joined the middle Snake River -- Salmon Falls Creek and the Owyhee, Bruneau, Boise, Payette, Weiser, Malheur, Burnt and Powder rivers -- but the tributaries were likely less important to the species than the mainstem spawning areas, the summary said. The building of the dams in the late 1950s and 1960s cut off 367 river miles to salmon, some 80 percent of historical spawning habitat, the document says. Researchers estimate 500,000 salmon returned in the late 1800s but that fell to 350 in the early 1990s when the salmon were listed as threatened. About 50,000 salmon have returned annually in recent years as managers have worked to improve fish passage at dams, improve water quality, reduce harvest and put cold water into the river by releasing water at specific dams. "There's almost 20 years of incremental improvements," Tehan said. The goal is to have a self-sustaining population of wild fish, meaning fish not reared in hatcheries. 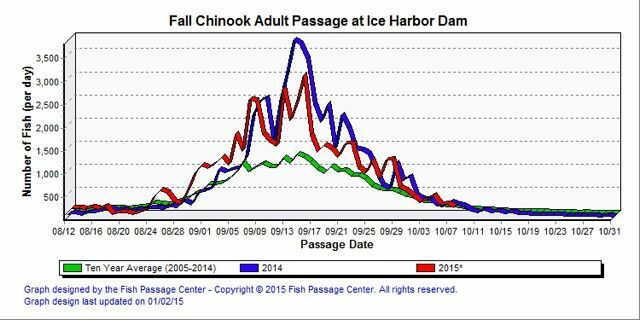 Of the 50,000 fall chinook that have been returning each year in recent years, about 6,500 are wild. Federal officials say that's enough to remove federal protections. However, officials say there are still too many unknowns about whether that population could remain viable for years to come. "Uncertainty remains about whether the abundance trends will persist and whether there are patterns of diversity that will sustain natural production across a range of changing environmental conditions," the report says. Idaho Power operates the Hells Canyon Complex, one of the company's main sources of power generation for southern Idaho. The company in 1991 started controlling flows at the dams to create stable spawning conditions for salmon as well as better egg incubation and rearing conditions, the report said. Idaho Power was still evaluating NOAA's plan Tuesday, but officials said re-establishing fall chinook in the middle of the Snake River would be a significant challenge. "While the infrastructure exists to move adult salmon from below Hells Canyon Dam into the Middle Snake, it is doubtful that these fish could reproduce successfully given the existing habitat. The feasibility of successfully reintroducing fall Chinook upstream of the HCC will remain uncertain until habitat and water quality conditions substantially improve," Jim Chandler, the company's environmental supervisor, said in a prepared statement. Chandler added that the fact that agencies are even considering re-establishing the fish in the Middle Snake shows the success of current efforts to boost the fall chinook population. For the present, the report says that successfully reestablishing a population above the Hells Canyon Complex would require substantial effort to improve habitat conditions in the middle mainstem of the Snake River which are not severely degraded. Actions plans in the report call for completing feasibility studies for upstream and downstream passage over the Hells Canyon Complex and reintroduction of the salmon. Those studies should be determined through the ongoing Hells Canyon Complex relicensing proceedings, which Idaho Power has been going through for at least 10 years, the report said. Also, it calls for encouraging local governments and stakeholders to implement actions to reduce nutrients and sediment to improve mainstream habitat. The plan estimates it would take at least 25 years to restore fall Chinook salmon to viability below and above the Hells Canyon complex. Public comments on the federal agency's proposed plans can be made through Jan. 4.